This lad is likely the culmination of life, the universe and everything. I like this photo a lot. I took it last week, after one of the lad's monthly baths, when he came back up in the pajamas he used to wear a lot by doesn't nowadays. Lately, he follows Eldest's lead -- who follows Pete's lead -- wearing the same shirt to bed that he wore all day and throwing on a pair of pajama bottoms. That front-tooth-missing, freshly bathed, freshly brushed, super-heroic Youngest really is the answer to my life, the universe and everything. Is that ever the truth...wish everyone could see it as clearly as we do! When I see little guys like that I could break out in a tune of John Lennons Beautiful boy! He's a doll! You are blessed! Don't you know you should never pickup Hitchhikers... I didn't even have to look that up. That is a wonderful photo! 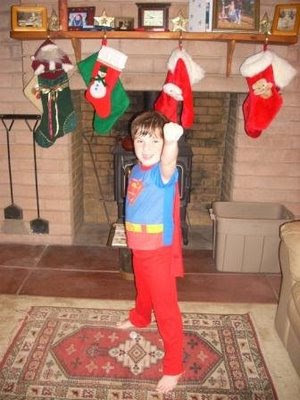 I can see why he is your superhero. Oh how I love this picture and the words that accompanied it. You know I feel the same about my Youngest. 42? What the heck is that all about? Nothing special about THAT number that I know of. I feel safe with him guarding Christmas - now I can go to bed and rest easy. Thank you, Youngest, for protecting us! Merry Christmas to you and yours, Patty! I didn't have to look it up either, although it's been awhile. Suddenly I feel the need to reread it.